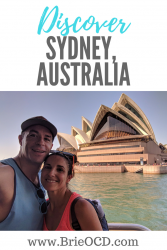 Traveling to Sydney is the reason we made the trip to Australia in the first place. 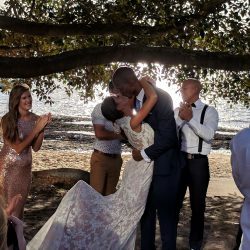 Our buddy Will Hill was getting married to the beautiful (both inside and out) Shelley. 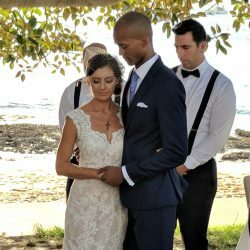 We didn’t want to miss this beautiful communion or pass up on the opportunity to travel the world! 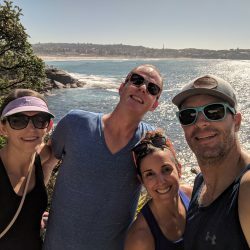 Come to find out, Sydney, Australia is a lot like San Diego, CA! In minutes you can be gallivanting around the city, lounging on the beaches or hiking in the mountains! Unlike San Diego, the public transportation in Sydney is really simple to use (more on transportation below) and they also have Uber. Free Wifi is also abundant in and around Sydney. When I travel to a new destination I usually do a lot of research and find out the inner workings of the city. However, I think this time because we were traveling with other people and going to a city where our friends lived I dropped the ball a bit. 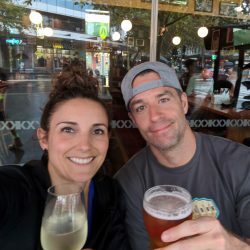 Before we left the country, I did ask around and get all the cool things to see and do however, I didn’t read the tripadvisor blogs so on the first day, my husband and I made a stupid mistake which cost us over an hour and a lot of sweat. We didn’t know that you needed an Opal card to take the bus. So on the first day, we waited for the bus to bring us to Bondi Beach. When he arrived, we tried to give him money and he rejected us. We didn’t realize at the time just how big of a mistake we made. That one decision was just the beginning of us running around Sydney like chickens with our heads cut off. 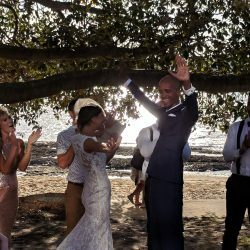 Read below on transportation to avoid the mistakes that we made! 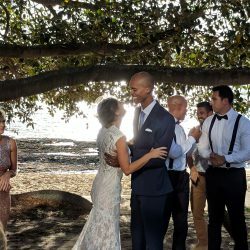 Just like in Cairns, Australia (view my review here), we rented an Airbnb in Darlinghurst which ended up being right around the corner from my buddy Will who was getting married. It was very convenient to Kings Cross station which is one of the main hubs for the subway. I would definitely stay in this area again. While the apartment was small, it was clean and close to so many shops, restaurants, bars and central to other areas. Pack your dancing shoes because there is a ton of nightlife in Sydney. We arrived at 8pm and my buddy Will was rearing and ready to go (I was not!). We all met up at a club downtown and had a couple drinks while techno music pumped. Not really my scene but it was fun to see everyone and meet some of his friends. In general, the bars and restaurants are always bumping in Sydney. 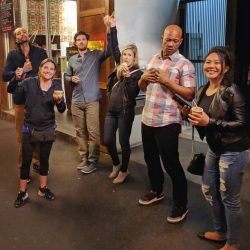 There is a hot spot on every corner and plenty of late night munchie spots ready to fill your belly after a long night out on the town. BEER: Beer in Sydney is same as up in Cairns for the most part. They have a ton of Victoria beers. I would say there is more variety but I think that’s just because Sydney is HUGE and has a boatload of bars and restaurants. WINE: I got the house wine at multiple places and I was surprised that almost every place served New Zealand Sauvignon Blanc as their house wine (I was not mad at that!!) and not Australian brands. I assumed that I would be drinking chardonnay all day, every day but I was wrong. 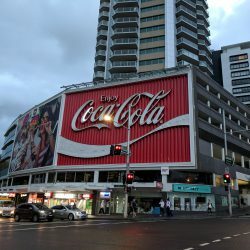 Sydney has great happy hours all over town. 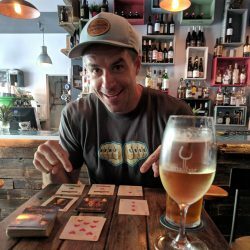 You can find house beer and wine for somewhere around $5 AUD ($3.80 USD) from 3-5pm (if not longer). COFFEE: I got a latte almost every time I ordered a coffee in Australia. That is until I found out their Iced Coffee with Ice cream!! WHAAAAT?!?!? Sign me up! One morning before heading to Manly Beach we stopped at The Fine Food Store for breakfast and I got the Iced Coffee with salted caramel ice cream. Holy Cow. It was decadent and delicious. Now I wouldn’t suggest getting that every morning because you may pack away a couple LB’s but it was definitely a nice treat and I just had to try it! Who knows when I would get the opportunity again?! Latte’s in Australia are good but I wouldn’t say anything special. My one complaint in Cairns, Sydney and Melbourne is the size of the to-go cups. I need a vat of coffee in the morning. The to-go cups in Australia are mini. I’m assuming that’s because Australians are used to espresso? If you dine in they do have bigger cups BUT they desperately need to step up their to-go game! You can get around Sydney by Bus, Train, Ferry or Uber. There are a couple different companies that run the ferries but for the most part you can use your Opal card for the first three modes of public transport. 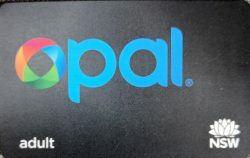 You can buy an Opal card at the ferry and train terminal or in any 7-11 that you pass. If you are going to be in Sydney for a few days I suggest starting with $20 and then just adding more as you need it. You can also “Top Up” (reload) directly from your phone, starting in increments of $10. Here are a couple fares to give you an idea of public transport costs. AIRPORT: The train to/from the airport is super easy and will cost you $17.76 AUD each way. 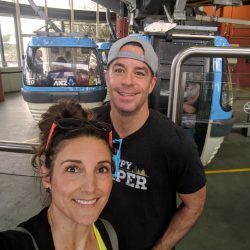 If you are with a group Uber is probably more cost effective because it will run you about $35 each way, however the train really is the easiest and you don’t have to fight the traffic. TRAIN: The standard fare is $3.46 each way. However Sundays you can ride ALL DAY for $2.50!! So plan a big travel day on a Sunday! You must use your Opal Card to ride the train. FERRY: The standard fare is $7.35. It is more expensive to ride the ferry BUT the view is AMAZING. 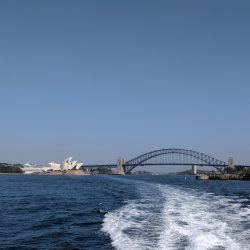 From the ferry you can see the Harbour Bridge, Sydney Opera House and so much more!! You can use an Opal card or you can also use a tap credit card to ride the ferry. Check for the soundbar on the front of your credit card to see if you have that capability. BUS: The standard fare to ride the bus is between $2.15 and 4.60. Make sure you have an Opal card BEFORE you go waiting at the bus stop. Don’t make the mistake that we did! 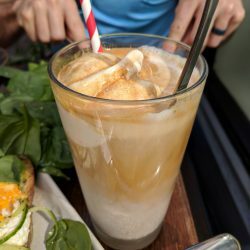 Fine Food Store – The Rocks – We went here for breakfast and got the Iced Coffee with salted caramel ice cream. We also split the avocado toast with a poached egg and the breakfast panini with their homemade chili jam. Everything was delicious! 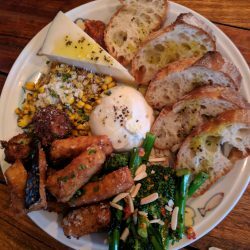 Mr. Crackles – Darlinghurst – late night eats! I got the sticky bbq pork sandwich and Hancy got the classic. Mine was waaaaay better but both were good! 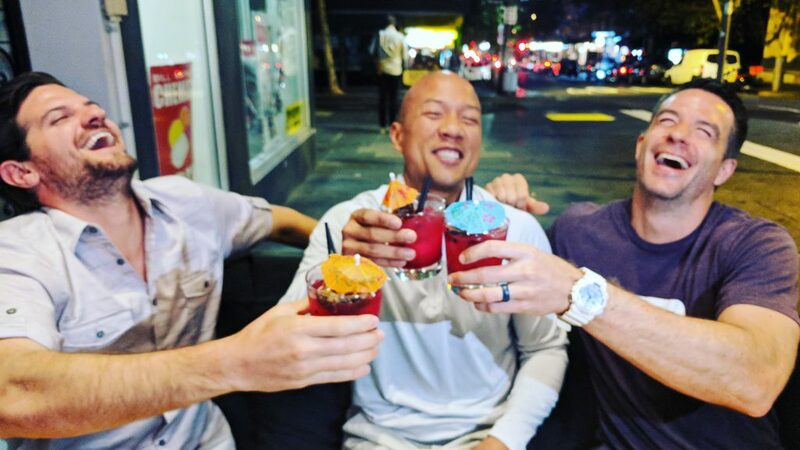 BL Burgers – Darlinghurst – late night eats! Burgers! I went next door to Mr. Crackles instead but all of my friends raved about these burgers. Messina Gelato – Multiple locations – mmmmm gelato. This gelato is top notch. My favorite was one of thier specials called Nuttin to it. All of it was so good though. This is a can’t miss spot! 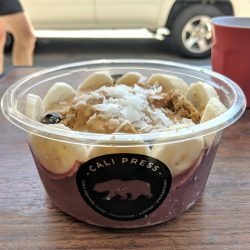 Cali Press – Bondi Beach – Smoothie, Acai place. I got the Acai bowl and it was delicious. It was super hot that day and this hit the spot! Mad Pizza – Darlinghurst – Delicious east coast type pizza. Every Monday all you can eat pizza for $25 AUD per person. The Soda Factory – Surry Hills – This is a speakeasy that fronts as a hot dog shop. You go inside the side door and are invited in to a dark place with live music and specialty hot dogs. Everyone had different favorites on the dogs they tasted. I didn’t try any because I was traumatized as a kid. We went on a field trip to the Saugy hot dog factory and they locked us in the freezer (with the dead pigs!). Thanks but no thanks! Anywho, live music and overall ambiance was great. 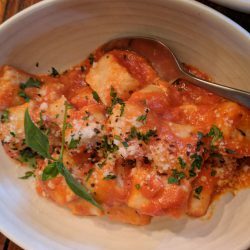 Buffalo Dining Club – Darlinghurst – Italian. 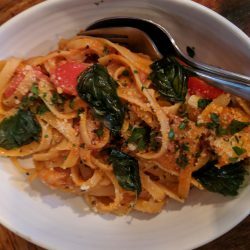 Delicious Italian. We got a bunch of stuff here. Cheese and meat plate, Calamari and some side salads. For pasta we got them all! 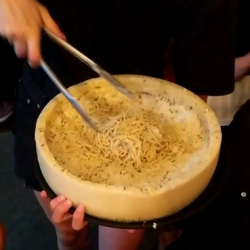 The Gnocchi, Shrimp fetticune was the special and the Cacio e Pepe which was pasta cooked and then mixed around a pecorino cheese wheel tableside. Not a big menu but EVERYTHING was delicious!! 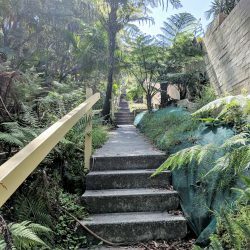 Botanist – Kirribilli – Do yourself a favor and skip this place. Beers are $12AUD and the food was overpriced and not good! There was one cauliflower dish that was delicious and the rest was just bleh. Don’t do it. 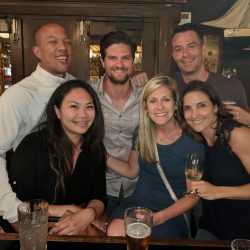 Small Bar and Kitchen – Kirribilli – We came here to escape the rain, play some cards and have a drink after we left the Botanist. It was cozy, cute and the food looked good. Next time we will just eat here! Jangling Jacks – Potts Point- Go for a drink and the fried chicken. Really tasty! 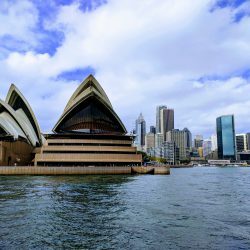 Sydney Opera House – Stop by for a drink, take a photo or watch a show. Right next to the ferry terminal in Circular Quay. 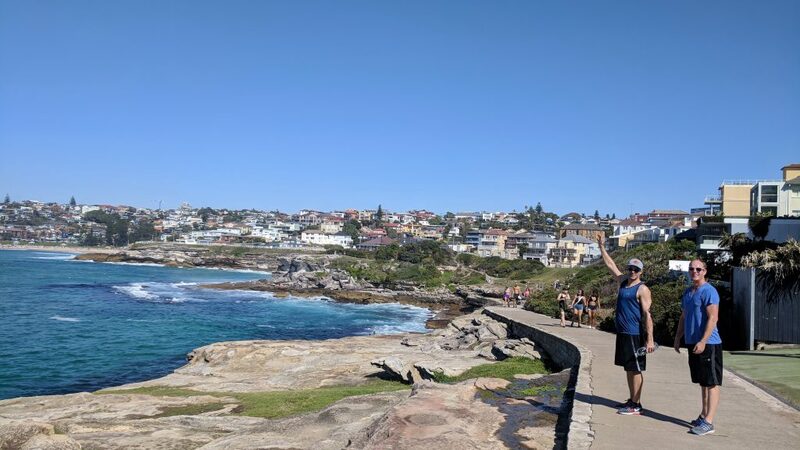 Bondi Beach – Bondi to Coogee OR Bondi to Bronte Walk – We were a bit late after our bus debacle and it was 99 degrees so we just did the Bondi to Bronte walk. It was gorgeous. If we had more time I would have definitely taken the bus to Coogee and then walked to Bondi. 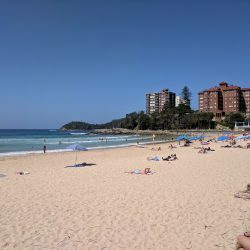 Manly Beach – Manly to Spit Bridge Walk – Take the ferry to Manly beach and do the Manly to Spit walk OR you can take the bus to the Spit and walk to Manly. The scenery is amazing and you can make stops along the way to take a dip and cool off. 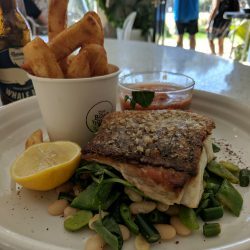 Then lounge by the beach or take the 15 min walk over to Shelly Beach to grab some lunch at the Boathouse. The food was all fresh and delicious. We got a fresh fish dish, tomato and mozzarella salad and some carrot cake. The flatbreads looked delicious as well as the Eugalo Vegetable plate looked heavenly and rustic. 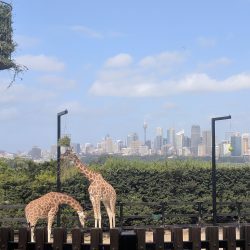 Taronga Zoo – Take the ferry over to the Taronga Zoo. I am not a big zoo person but everyone said we had to go. 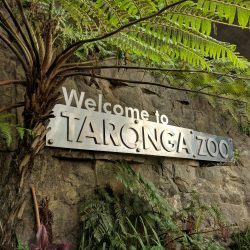 The zoo is not too big so it is fairly easy to navigate and not as daunting as the San Diego Zoo. When you arrive via ferry you join the queue to take the sky cab up to the entrance. You get to see a few of the sights on the way. Definitely go see the Bird show! It was short and really cool! The view from the show is also top notch. The squirrel monkeys were also cute as well as the fierce tigers. Plan to spend 3 hours at the zoo. Please Note: Do NOT buy the Captain Cook Cruises hop on, hop off ferry and zoo pass. The Captain Cook Cruise ferry boats hardly ever run (at least not when you need them) and you end up paying for regular ferry so that you can get home in a timely manner. Blue Mountains – This is an entire day trip. We did not have time to do this but I hear it is beautiful and great hiking. If you have the time and the leg power then take a trip to the Blue Mountains. 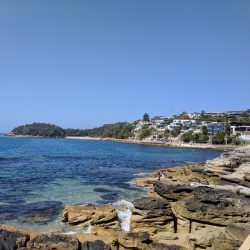 Watsons Bay – This is where the wedding was and is a super cute area. Take the ferry over and walk around, see the shops, lounge on the beach and have a cold beverage. 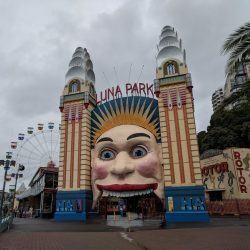 Luna Park in Kirribilli – This is an amusement park that could be fun with the kids. It was raining the day we were in Kirribilli so we just walked around that area. Its right under the Harbour Bridge and on the water. 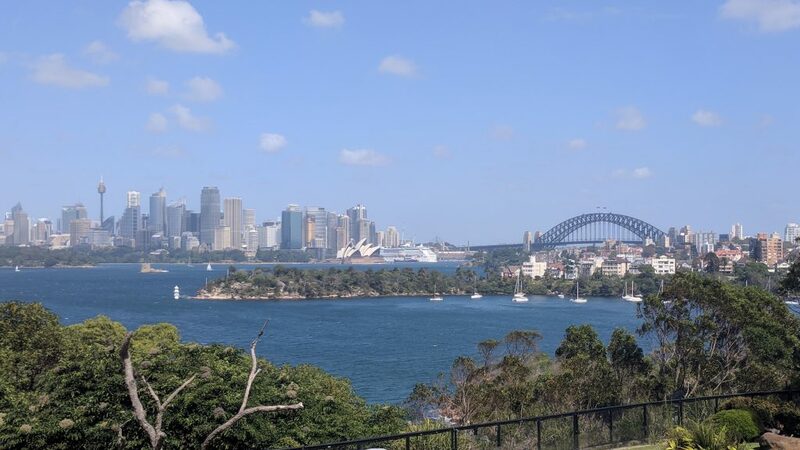 Harbour Bridge – After you walk around Kirribilli, walk home over the Harbour Bridge! Once in a lifetime opp! The walk will take you about 20 minutes. 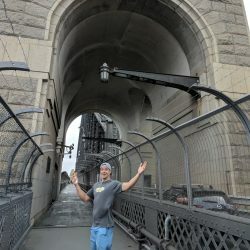 If you are daring, pay to do the bridge climb and climb over the bridge! Hunter Valley Wine Tasting – We didn’t do this because we didn’t know about it! But if I ever go back I will definitely book a Hunter Valley wine tour through tripadvisor and get my tasting on!! Walk around any of the towns – Take the bus or train and just get dropped off in any of the towns and walk around. Everywhere has tons of shops, restaurants and bars. Go Crazy! 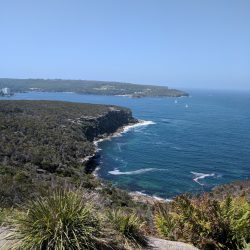 We spent 4 full days in Sydney and managed to do a bunch of stuff but not even close to everything. Sydney is HUGE and even if you had weeks there’s still so much more that you could’ve done. Have fun and enjoy this beautiful city! View from Zoo Bird Show!